The next morning, we see Kitolis seated at his desk. The telephone rings. As he reaches for the receiver, we hear Alok Lee advise him, "Remember what I say - tell him no more no less, but get him here!" Kitolis nods and picks up the phone. "Yes, Mr. Trevor. Yes it is. I have it all arranged. This afternoon �at the old wharf at the dry dock. Bring the rest of the money." Kitolis hangs up. Alok congratulates the old man in broken English. "Excellent. Very well done. The attach� case we found in Mr. Lassiter's room was quite interesting. Maliable, manipulative mind drugs ... and yet in Mr. Lassiter's attach� case. Tell me old friend, did Trevor appear ill when you saw him. Did his hands shake? His eyes, how did his eyes look?" Kitolis repeatedly insists that he didn't notice anything unusual. Alok is displeased. "You are not very observant old friend. I was so certain you'd have much to tell me." 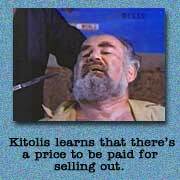 Kitolis begins to panic. "I helped you! I did what you asked! We had a deal," the old man cries. Alok laughs at the helpless man. "We'll burn some incense for you dear friend. Yes, we had a deal. You're being paid. Have no fear, I leave you in experienced hands - it's a beautiful thing. He is an artist." Alok exits the office. The man who sliced up Carl Wagner whips out his trusty blade and carves into Kitolis' throat. At the same time across town, Lassiter meets with Cruz and Miss Walker, who acts cold and distant because of the prior evening's "tough love." Cruz informs Lassiter of a suspicious crime scene by the docks, and the three drive off to Kitolis' joint. As they enter the building, Inspector Cruz explains that Kitolis specializes in procurements. "Either he or Trevor left two bodies here yesterday." Without warning, an Asian thug sprints out of the building. When the goon sees the cops, he runs back inside. Lassiter barrels after him. He corners the thug in Kitolis' office. The thug tries to beat Lassiter with a chair, but Lassiter puts his fist straight through the wood. Lassiter pins the bad guy against a wall and levels several karate chops at him. "You gonna tell me where Trevor is?" Inspector Cruz arrives and tells Lassiter to stop beating the man because they could use him for information. Lassiter halts his assault, but he flips his hair defiantly just to let Cruz know who's got the nicer hairdo. After his dynamic hair flip, Lassiter assures Cruz that he didn't throw a single killing punch. Cruz replies, "Well it's a good thing you didn't because he knows a lot. Well make him talk. He'll talk. I promise you you can finish him off if he doesn't." The buzzing of flies draws Lassiter's attention to the hanging, bloody body of Kitolis. Lassiter looks away in disgust. Time passes. We don't get to see the thug's interrogation, but we are to assume the police learned what they needed to know about Alok's plot. Lassiter meets Cruz near a helicopter and says, "Well officers, I hope that dude was telling the truth. How far is it to the wharf?" Cruz assures Lassiter that it's not far by air, and that the police units will close in on Trevor silently. Lassiter disapproves of Cruz's plan. "I'm against this. If you go rushing in there, Trevor might -might break." Cruz smiles knowingly. "Thank you, Mr. Lassiter. It's unfortunate your superiors didn't give you another option." Lassiter begins to board the chopper, but Miss Walker stops him before he enters. "I know what you're going to do. You're going to try to take him down," she states. Lassiter replies, "It's the only thing I can do." She looks concerned. "But what are you going to do what if he resists?" Lassiter stares into her eyes and kisses her. She doesn't fight him. Without another word, he enters the helicopter and flies away. At the wharf, Trevor and Lee Su gear up to receive their boat from Kitolis. Trevor prepares his paramour for possible trouble. "Alright - no matter what happens, you here stay in the car. It's going to be alright. Don't you move until I get back here." Lee Su seems worried, but agrees. "Trevor, will you kiss me?" He obliges. They smooch lovingly, then Trevor exits the vehicle. Trevor slinks around a gate. He's visibly shaky and appears quite ill. He looks around for signs of a setup, then disappears out of sight. Once the coast is clear, an Alok thug approaches Lee Su, and drags her from the car at knifepoint. Before he can get very far, a ground force of policemen apprehends him. When she sees the secret police stakeout, Lee Su realizes that Trevor is walking into a trap. And she's helpless to stop it. Nearby, Trevor creeps cautiously, looking for Kitolis. Suddenly, a voice bellows out: "Mr. Trevor. We are about to meet at last. There is no need to hide from me. You are completely surrounded. And we have the girl." Trevor looks to the distance and sees Alok and his goons. "Who are you?" Trevor yells. Alok strains to scream over boat horns and the ocean. "That doesn't matter, does it? I have something you want and you have something I want. Come out without your weapon, I will come out without mine. We can settle this without further trouble. Come out Mr. Trevor. Here is Mr. Lassiter's attach� case. Relief for you." 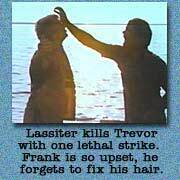 Trevor throws down his weapon and asks, "Frank Lassiter is here?" The frustrated Alok hollers, "Come closer. I do not want to shout!" (Actually, the shouting is rather funny. Thanks for drawing attention to it, Alok.) Trevor enjoys the shouting as well, and tells Alok that he's not moving any closer. "Very well," shrieks Alok. "Project Kill is what I want. I want to know everything about it. I will trade you the girl's life, that and a considerable sum of money. In any currency you name. Your contact had an accident. You can have this boat if you agree to my request. The girl will be returned to you, you have my word." Trevor smells a rat, but is concerned about his new lover. "Let he girl go now!" he demands. "I cannot do that Mr. Trevor," says Alok. "I have invested a large sum in you. If I have to do one more to get what I want I will." Trevor grows angry. "You've been following me for some time now haven't you?" Alok beams with pride. "Do not use the word 'following'. 'Investigated' a better word. It started from Mr. Wagner, and �" The thunder of a helicopter distracts Alok before he can finish his sentence. Trevor takes advantage of Alok's confusion and attacks his three bodyguards. He swiftly dispatches them with deadly karate chops. Alok flees during the commotion, but Trevor is close behind. The police helicopter lands. Lassiter and a team of cops leap out. He instructs them to stop Alok's boat at the end of the pier. They comply. Elsewhere, the ground team engages Alok's thugs with gunfire and grenades. The cops successfully wipe out the remaining Asian strongmen. Trevor closes in on Alok. The chubby black market overlord tries to weasel his way out of an ugly fate (which might have been more successful had he NOT admitted to murdering all of Trevor's friends). Alok whines like a frightened puppy. "I not do anything. I'm no bad man. Mr. Trevor, please!" Trevor's eyes ignite with hatred. He snaps Alok's arm, and delivers multiple crushing punches. "This is for an old friend!" Trevor screams as his fist crashes into Alok's skull. "And this is for the sailor!" His final strike kills Alok. He stares at the lifeless bloated body for a few seconds, then rises to leave the area. He doesn't get very far. Lassiter appears and blocks Trevor's path. "John, you gotta come back with me." Trevor shakes his head. "Frank, I'm not going back." Lassiter draws in a deep breath. "Well, I have to take ya." Trevor remains firm, despite his obvious physical weakness born of the drug withdrawal. "I'm going around you. If you think you could take me then go ahead and try. Otherwise, step aside." Trevor tries to walk past Lassiter peacefully, but the younger agent won't budge. They approach each other like crazed animals. Trevor assumes a defensive pose. Lassiter strikes first with a kick. Trevor goes down but recovers quickly. Trevor lands two hard punches, briefly knocking the wind out of Lassiter. The two men face each other again - this time Lassiter fakes out Trevor with a false chop, then kicks his former mentor in the jaw. Trevor plunges to the ground. Lassiter stands over his unwell trainer. "You know what I have to do. You taught me. Priority One and all of that." Trevor won't give up, even in his weakened state. "Well that's your problem isn't it Frank?" Trevor is obviously injured, but he gathers his composure and rises to his feet. Lassiter is pretty battered at this point, too. Trevor makes one more attempt at leaving peacefully. He turns his back to his old student. "JOHN!" barks Lassiter. Trevor spins around to see Lassiter gearing up for a running jump kick. He blocks Frank's kick and knocks the younger agent down. Trevor crouches over Lassiter and tries in earnest to break his neck. Trevor begins to lose his grip on the struggling Lassiter. Frank flips his mentor over his back, and lands several sledgehammer-like punches to Trevor's chest. John falls to the ground. Lassiter backs away from the injured senior agent. Trevor's weak and ill, yet he still manages to pick himself up to face his former friend. "What's wrong, Frank?" he asks caustically. Lassiter is visibly upset. He tries to reason with Trevor one last time. "Come back, John!" "What's a matter, do you need some help?" taunts Trevor. He raises his arm to simulate a deathblow. Lassiter erupts into a primal scream. In slow motion, he delivers one final, brutal, skull-crunching strike to Trevor's face. Trevor goes down. His injuries are fatal, but he's not dead yet. A beat-to-hell Lassiter stands over Trevor's twitching body. Lee Su arrives on the scene, and cries softly when she sees her dying lover. Trevor struggles to offer Lassiter a final warning. "Now they're going to come after you." As he dies, Trevor exchanges a helpless, hopeless glance with Lee Su. Then the government maverick breathes his last breath. Lassiter squeezes his eyes shut as if in extreme emotional pain. Then slowly, solemnly, he rises. He is too distressed to flip his hair. Inspector Cruz approaches the bruised agent. "Your briefcase, Mr. Lassiter." Frank takes the attach� and looks out toward the ocean. Several military ships loom on the horizon. Trevor's last words haunt Frank. "Now they're going to come after you." Lassiter hurls his drug-laden briefcase into the sea. The Lonely Man theme plays behind him as he walks away to face his own bitter future. Next: Behind-the-scenes Project Kill commentary from Pat Kelly, Joe Schulten, and David Sheldon.